The wonderfully named Killer Duck Decals sells, well, decals. Stickers for your phone or smallish electronics. But not just any stickers. 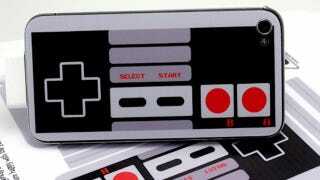 These NES controller iPhone decals kind of make me wish I had an iPhone, not going to lie. (The store does stock some Android decals! But not, sadly, for my phone.) On the other hand, the potato GLaDOS decal will fit very nicely on my iPod touch. And maybe our Roku is close enough in size to an AppleTV unit to get away with that Portal motif. Because I'm pretty sure I need that. There are many, many more where these came from; hit up the link to make every device you own even more geeky. Did someone say flux capacitor?